We were privileged to be given an extremely informative talk by Dr Nigel Pearce . 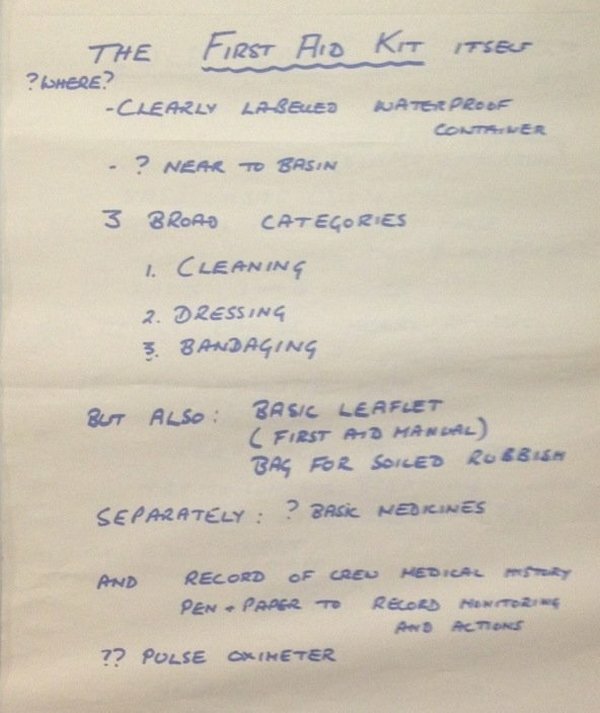 Below are photographs of the flip chart sheets and some additional brief notes. 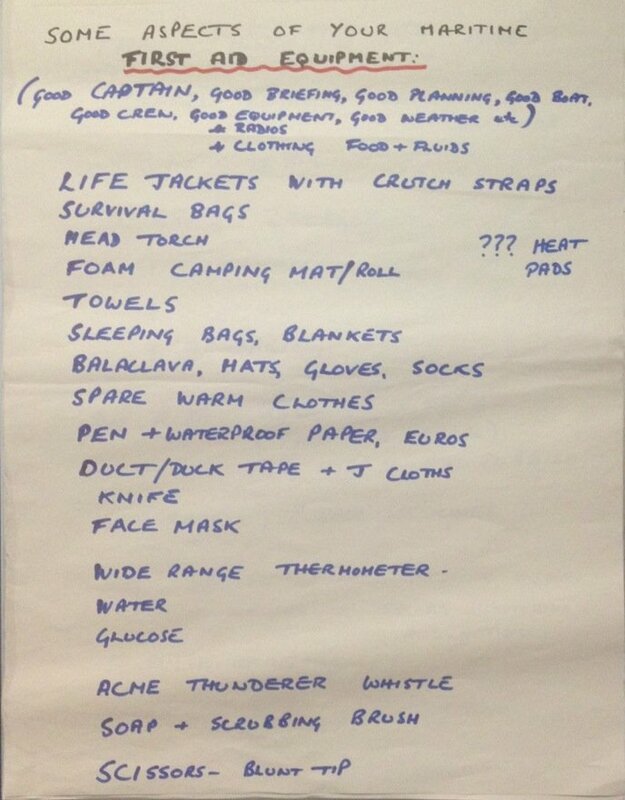 These can form a useful aid memoir to refer to and the link to this page could sensibly be passed to members and crew who were unable to attend the talk. 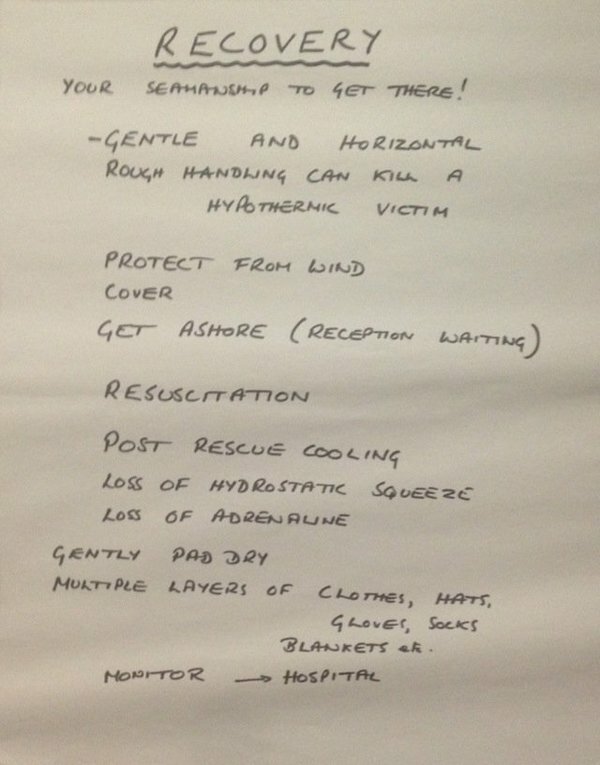 RYA Maritime First Aid, Some notes, not comprehensive, from Dr Nigel Pearce. Updated 07.02 2013. Cold water shock (cws): Must gasp after 5 or 10 seconds, then very fast breathing. Inhalation of water can lead to closing of the airway, suffocation and death by drowning. Vasoconstriction of surface blood vessels and a surge of adrenaline leads to a very fast pulse and high blood pressure. This can lead to a stroke or heart attack and death- The cws lasts for 2 or 3 minutes. 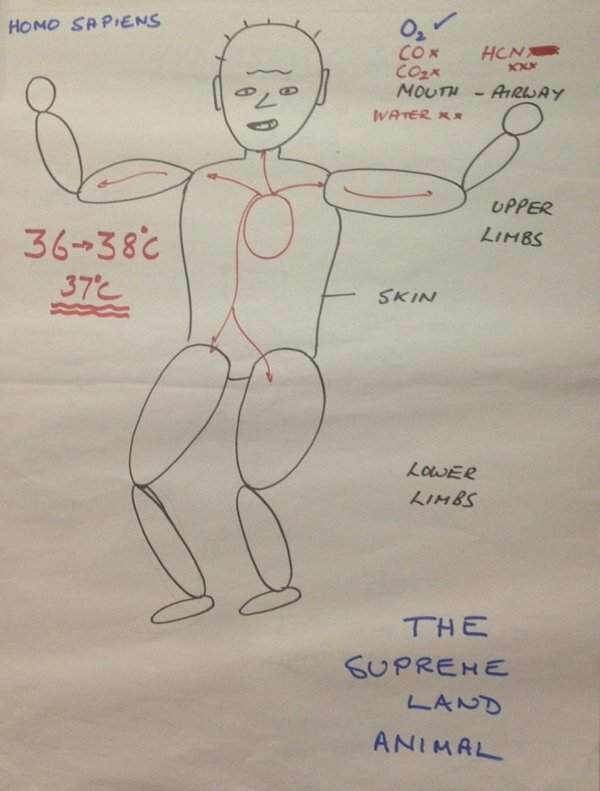 Cooling of the peripheries – feet, legs, hands and arms cooling leads to poor, weak, stiff, uncoordinated action. 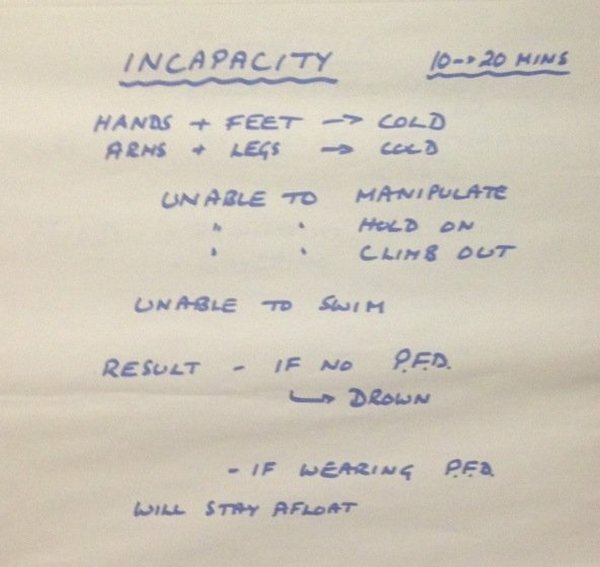 Therefore, unable to swim effectively, unable to hold onto a line, unable to climb a ladder or side of boat. After a time (variable) this cooling leads onto real core hypothermia. 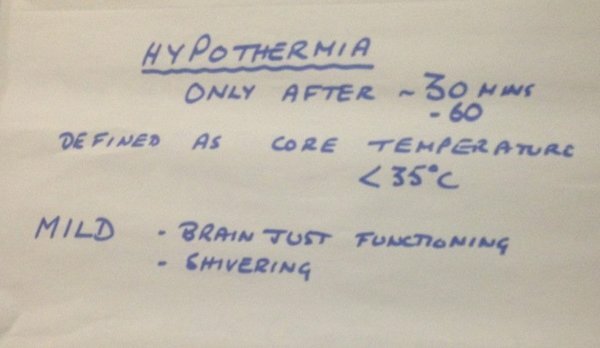 Hypothermia – where the core of the body is now cooling and is below 35 degrees centigrade. First the brain function deteriorates, then the heart and lungs weaken, chemistry goes all wrong. After some initial help by shivering, this stops. Body sinks eventually into unconsciousness – death can now be from inhaling water and drowning, or by the heart going into a useless rhythm eg ????? VF (Ventricular Fibrillation??) or stopping. Rescue: Mayday. Rough handling can kill a hypothermic victim. Especially be gentle on the neck, no unnecessary bending. Try to keep horizontal during recovery from the water, but speed is essential. If breathing, raise legs and put in recovery position. Protect from the wind, use orange survival bags. Cover cranium, hands etc. Monitor. If resuscitation starts it must be continued non-stop. Get ashore asap – helicopter, or rib + waiting ambulance. Any rescued victim needs mental stimulation to keep fighting – especially talk about families and especially their children. Note there will be initial further post rescue cooling, and therefore possible slipping into unconsciousness. No alcohol. No drinks unless sure that there will be no further deterioration to unconsciousness. The loss of the hydrostatic squeeze and adrenaline drive contributes to deterioration and peri or post rescue collapse. Drowning: Prevent by good seamanship. Maintain lifejackets. Wear them and crotch strap. 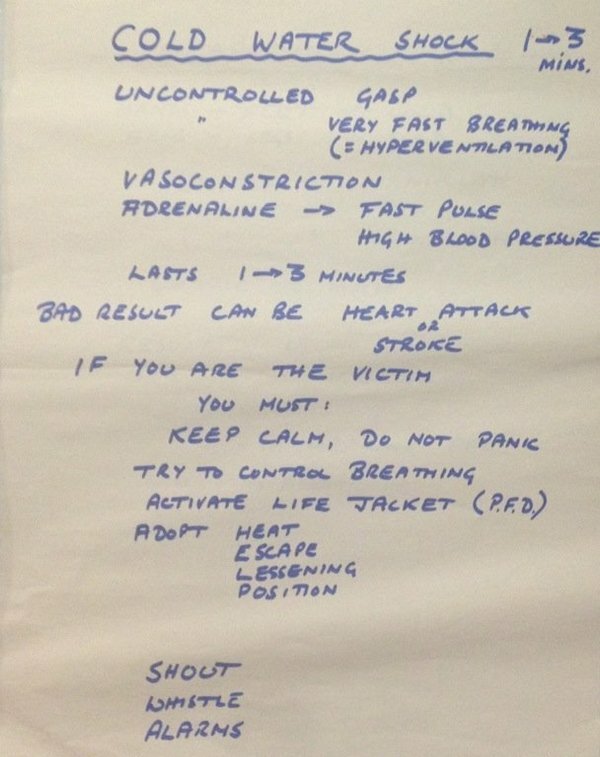 Resuscitation of a drowned victim starts with 5 rescue breaths before continuing with the normal 30 chest compressions: 2 rescue breaths, 30:2,30:2 etc. A victim of near drowning (i.e. they have inhaled a few drops of water) can later suffer secondary drowning-coughing, shortness of breath. Urgent hospitalisation and intensive therapy are needed. A victim who is nearly drowning cannot wave. All you see is a small head on the water surface. Only your vigilance and prompt action can save them. Most drownings are within 3 metres of help /safety. Beware groups of children or adults playing, especially in dark muddy water. All groups of playing children need careful observation by many adults, and in a yacht club context, all wearing tightly fitting buoyancy aids. Hydrocution is the sudden stopping of the heart when the face is suddenly dunked into very cold water. In a vertical rescue to a helicopter a victim loses the hydrostatic squeeze, and there is extra lift against gravity. This could lead to a syndrome that I call “alive in the water, dead in the helicopter”. A 2-strop system is better with the victim lifted in a foetal position, but it takes longer to arrange. When a rescued sailor is in shock in a rib, have the head to the stern as the legs will then be lifted by the tilt of the rib, helping drainage of blood from the legs to the heart. In a helicopter they would put the head to the front. The sea surface water that crashes onto our beaches is warmer ( 15 degrees) than the deeper water (10 degrees), and is further heated by the sand. A rough sea will mix these waters, reducing the surface temp to 11 degrees. 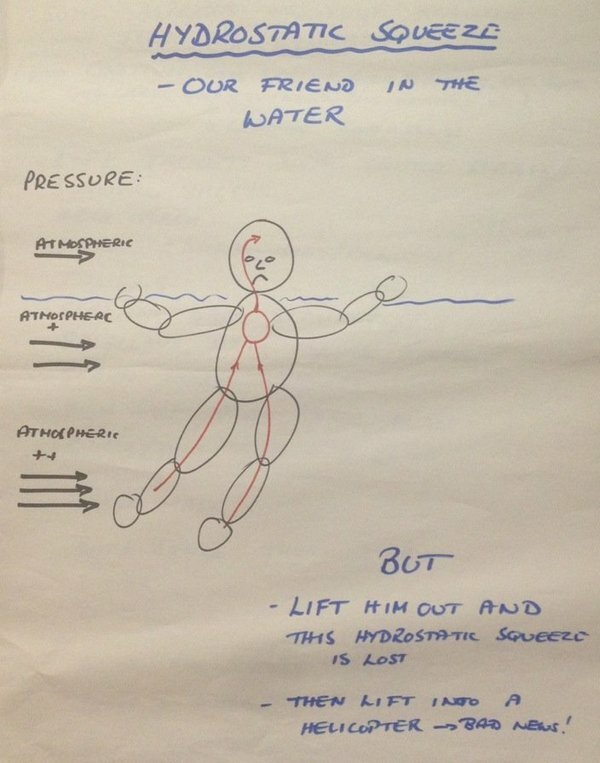 Sea Survival: Anyone who has undergone any training stands a much higher chance of survival. In the 1979 Fastnet Race, some took to a life raft too early. They died, their yacht survived. In WW2 30,000 survived Naval sinkings and reached liferafts. But 2/3 of these subsequently died of hypothermia, drowning, dehydration. Drinking seawater kills. South, the Shackleton saga — they survived because of planning, preparation, superb leadership and huge seamanship skills. Apart from Shackleton, most successful survival sagas have been in tropical waters. Tony Bullimore survived. He was calm and carefully analysed. He was determined and had a will to survive. He had previous training and knowledge of survival requirements. He had experience and a survival suit. He was a touch tough! And of course, his EPIRB worked, and the Australian Navy reacted and acted magnificently. The Estonia disaster — the survivors were mostly male aged 15-44. Sea temp 12 degrees. Many others panicked. Many lacked the strength with their numb hands to get into a raft. Many survival packs could not be opened. There is no such thing as an accident at sea. They are all incidents with causes. Some hypothermic survivors of WW2 died in their rescue boats from overenthusiastic rewarming. All the blood, perhaps thickened by dehydration rushes to the warmed skin, blood pressure drops, then collapse and even death. We should mostly rewarm from the inside to the outside i.e. from our own internal metabolism. Local heat sources can cause collapse. A warm dry environment, loads of clothes and blankets, including head, hands, feet. Constant company and care. Constant monitoring. Food and drink. A hot shower for an exhausted, properly hypothermic victim can lead to collapse. In the life raft, the leader at the beginning is often not the leader by the end. In the disaster situation, there is often initial disbelief, then panic. But the prepared, trained, determined, calm, fit, strong individual, with the right clothing and equipment, and some luck, might well survive. Historically (Scott et al) suffered from sweating into their clothes. These damp clothes lost their insulation. The sleeping bags became similarly wet and even froze. Today the modern quality breathable clothing really helps. Dinghy sailors’ gloves have practically no insulation properties. They are there to protect the hand from wear and tear on the ropes. Sunglasses protect the eyes. Broad brimmed hats protect the face. Use SPF 30 -50. Even a small degree of dehydration impairs performance. Look after yourself and your mates. Food and drink are great morale boosters as well as performance enhancers. The Captain must be an inspiring and caring leader. He must know about his crew’s health. He or she carries – enormous responsibilities. His boat, equipment, training, practise and seamanship must earn him their respect. Man is the supreme land animal. Sailing exposes us to the elements, especially the cold, hostile water. Respect It. Take care of yourselves and your mates and charges. Maintain and use your safety equipment. You will not be able to comprehend the instructions in an emergency. Keep a good look out all around all the time. Poole Harbour and sailing is fantastic. Plan, prepare and when appropriate, get out and enjoy it.